Our studies of the secular rises in type 2 diabetes in the Pacific island of Nauru and Indian Ocean island of Mauritius have provided a barometer to predict the epidemic globally. There has been an almost 6-fold increase in the number of people with diabetes in the last few decades. The International Diabetes Federation (IDF) has reported that the number of people with diabetes will escalate from 285 million to 438 million between 2010 and 2030 and the number of persons with IGT will grow from 344 to 472 million. This means that by 2030, there will be over 900 million people globally with or at high risk of diabetes and its associated 2 to 3-fold cardiovascular risk. Diabetes is now a global epidemic with devastating health, social and economic consequences and one of the largest epidemics in human history. This is now imposing a huge burden on health-care systems and national economies. Type 2 diabetes is increasing rapidly all over the world. Since it develops from an interaction between genes and lifestyle factors, it can also be prevented by influencing its modifiable risk factors. During the last two decades, several well-designed and properly conducted controlled trials have confirmed that lifestyle intervention is highly effective in preventing type 2 diabetes in high-risk individuals. Such trials have been carried out in many different populations and living environments – all of them producing similar beneficial effects. Moreover, long-term follow-up of the participants in such trials has revealed that these benefits are sustaining long after the actual intervention has been stopped. It is however likely that different people benefit from different interventions, and this may partly depend on their genetic constellations. The results from these trials must now be applied in the real-life settings in order to stop the pandemic of type 2 diabetes. The material and structural properties of bone determine its strength. Bone must be stiff – resistant to bending therefore mobility and loading are possible. Bone tissue must also be elastic – able to absorb energy imparted during loading by deforming and returning to the same length without damage. These contradictory properties are achieved by varying the mineral content of the collagen tissue of bone; if under-mineralized the tissue may be too flexible, if over mineralized it may become too brittle. These properties are also achieved by structural design. Tubular bones have the mineralized cortex placed distant from the long axis to increase resistance to bending. In the vertebrae, trabecular bone, an open porous structure, allows greater deformation for absorption of energy like a spring but the peak tolerated loads are lower than in the long bones. These material and structural properties are maintained by bone remodeling and become compromised when remodeling becomes too fast, too slow or unbalanced. Understanding of the pathogenesis of bone fragility, its prevention and reversal depend on finding ways of measuring these properties of bone in vivo. The endogenous ligand for growth-hormone secretagogue receptor (GHS-R) was discovered in 1999 from stomach and named it “ghrelin,” after a word root (“ghre”) in Proto-Indo-European languages meaning “grow”, since ghrelin stimulates growth hormone (GH) release from pituitary. In addition, ghrelin stimulates appetite and increases food intake by acting on the hypothalamic arcuate nucleus, a region known to control food intake. Thus, ghrelin plays important roles for maintaining growth hormone release and energy homeostasis in vertebrates. The diverse functions of ghrelin raise the possibility of its clinical application for GH deficiency, eating disorder, gastrointestinal disease, cardiovascular disease, osteoporosis and aging, etc. Thyroid hormones, thyroxine (T4) and 3,5,3’ triiodothyronine (T3), are present in all members of the vertebrate kingdom. The active hormone, T3, is required for such varied processes as metamorphosis in amphibians, normal growth and brain development in infants and children, and the maintenance of normal metabolic rate in adults. This invited review summarizes the contributions of Dr. Larsen's laboratory to this field, ranging from those in public health to those defining the molecular mechanisms required for the monodeiodination of T4 to form the active hormone, T3. Cinnamaldehyde (CNMA) is a widely consumed food flavoring. In addition, it is also used as an antiseptic and an antiallergic drug and as a tonic in traditional Chinese medicines. Certain behavioral parameters were carried out in this study to evaluate the effect of CNMA on rats. Rats were given CNMA orally by gavage at the dose levels of 2.14, 6.96, 22.62 and 73.5mg/kg body weight/day for the period of 10, 30 or 90 days. Only the group of rats treated with CNMA at the dose of 73.5 mg/kg body weight/day for 90 days showed significant changes in the olfactory discrimination, auditory startle response and negative geotaxis behavior. No treatment related impairment of cliff avoidance behavior was noted. Thus, CNMA has an effect on the neuromuscular system. This is evident from changes in acetyl cholinesterase (AChE) and creatine kinase (CK) activities in the serum of these rats. Further examination of non-enzymatic and enzymatic antioxidants and also thiobarbituric acid reactive substances (TBARS) in the serum showed CNMA induced oxidative stress that resulted in the behavioral changes of these rats. From this study, we can conclude that the oxidative stress induced by CNMA has an effect on rat behavior and its effect is time and dose dependent. Objective: To study the prevalence and correlation of cardiovascular disease (CVD) risk factors in apparently healthy, urban south Indian young adults. Research Design and Methods: Eighty-five apparently healthy men and women volunteers aged twenty to thirty years with no smoking habit were recruited as study subjects. Anthropometric measurements, blood pressure, plasma zinc, adiponectin, resistin, blood glucose, insulin concentration and lipid levels were measured. 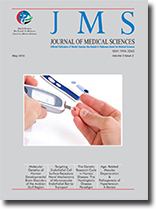 Results: A significant proportion (43.8%) of the study subjects had poor insulin sensitivity as judged by homeostasis model assessment (HOMA) ≥3.16 and a proportion of 36.3% had body mass index (BMI) ≥23.0. Total cholesterol (TC) and triglyceride (TG) concentrations were higher than the normal values in 7.1% and 8.2% respectively while HDL cholesterol (HDL-C) was less than the normal value in 58.8% of the subjects. 7.2% of the subjects had Zinc deficiency. Significantly higher proportions of males had higher BMI and higher HOMA compared to females (P<0.05). Mean zinc values were higher in females compared to males. BMI was directly associated with HOMA (P<0.05), while zinc was inversely associated with HOMA (P<0.05). Of the two adipokines tested, resistin was not associated with any of the parameters studied, but adiponectin was associated both with BMI (p <0.05) and HOMA (p <0.06). Conclusion: Poor insulin sensitivity and low HDL-C concentration, which are important risk factors for CVD are commonly prevalent in young adults. Adiponectin was inversely associated with insulin sensitivity. The finding that zinc levels are lower in males compared to females indicates a likelihood for zinc having a role in insulin sensitivity and a male predisposition to develop insulin resistance and higher BMI.